To assist and advance the capacity and capabilities of Kaitiakitanga through environmental education and research. "Acknowledging matauranga Māori as a living a breathing knowledge system, recentralising it as a vital and central component of understanding kaitiakitanga, and building action based initiatives founded on these understandings"
Ma wai e tu hei kaitiaki?....MAKU!! Who will stand as a custodian for our world?.....I WILL?? Our education projects adopted and embrace a Maori approach to Kaitiakitanga, environmental management and problem solving. A Maori approach is a whanau approach, it acknowledges matauranga Maori and the holders of knowledge, it is reflective and progressive, it follows tikanga Maori, and it is place based. Many thanks to our funders: Nga Matarae Trust and the Port of Tauranga. This programe hopes to provid tamariki/rangatahi with an alternative opportunity to experience the marine and coastal environments, through environmental scientific sampling processes and methodologys. We hope that the programe will empower our kaitiaki of tommorrow, by growing a greater awareness and understanding of local issues, by developing environmenal monitonging skills and knowldge, and by learning about the importance of informed descision making. 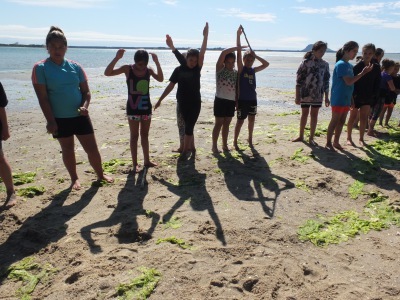 ".....giving the tuakana the chance to share their knowledge and understandings, establish connections and role model Kaitiakitanga.."